It's a beautiful Spring day here in Houston today and I'd much rather be lounging in a gorgeous poolside cabana than in the office. Unfortunately though, it's Monday and my backyard is still in the state in which we bought it (i.e., completely empty) so until we have the time and funds to turn our attention to landscaping, I'll have to make do with a little virtual daydreaming, courtesy of Kristen Hutchins Design. 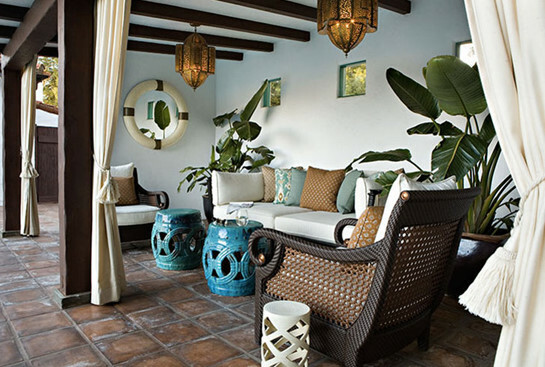 I love how Kristen has infused classic hacienda style with other global influences like the Morroccan lanterns, the Chinese garden stools, the turquoise Ikat print and the British Colonial furnishings. Despite this cultural mix, the overall effect is seamless and tramquil, with the dark browns and creams providing a neutral base for the pops of turquoise. And how awesome are these mini-canopies (with the giant tassels!) for the chaise lounges. Not only are they great aesthetically, but they're practical as well. I love getting a little bit of sunshine, but I'm always vigilent about making sure my face/neck are in the shade. The fabric on the pillows is called Tilbury by Laura Ashley and is available through Kravet. It's been making the rounds lately on the blogosphere and I absolutely love it. One thing I would change though: I'd be trading in that Pellegrino for a glass of white wine or a margarita. It has been raining here since Friday.....this scene looks like pure heaven! I love her style! I'd love to have someone as talented as her come do my back yard. I'm with you on the margarita!! 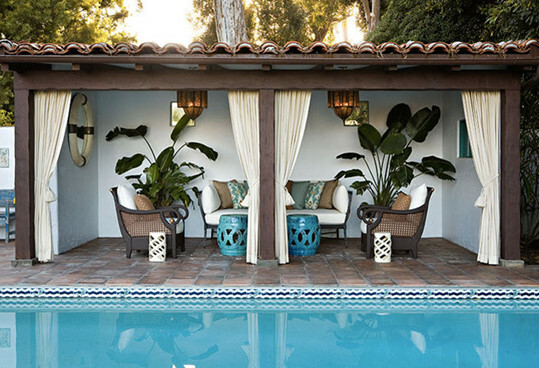 I've loved this poolside retreat for awhile, I love your feature of it! What an amazing outdoor space and pool! Love this post, darling! Sigh...it's been raining in Boston for three straight days. And my raining, I mean torrential downpours and flooding. I would so rather be sitting on that pool deck! 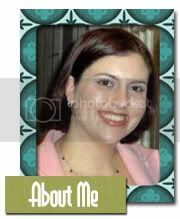 FYI, lsfabrics.com has something very similar to that Laura Ashley for Kravet fabric. It's called "Khanjali" and it's only $20/yard! So gorgeous! Love the lanterns and the blue! Ooh yes, dreamy! Turquoise and pools just go together! Well, our backyards sound like they share some things in common, it will be some time before I know what to do with that project! being from california, there's nothing i love more than outdoor entertaining. this looks so chic and relaxing. What a beautiful, cool spot for a hot summer day. And yes, I'm with you, a margarita for me too, please! So pretty - I've never seen it before! I'd join you with a margarita in hand. Or maybe some prosecco! Yum! 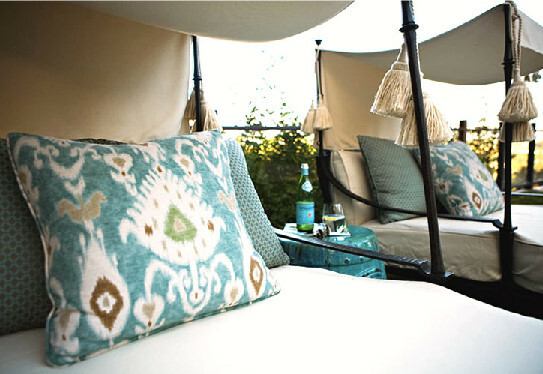 how beautiful - I'm all over those ikat pillows, just bought the fabric! Beautiful space...seems like a vacation getaway! This looks like you. I featured that fabric too after seeing it in A Single Man. Gorgeous! I forgot you live in Houston...the hubs and I, my sister, my brother and his girlfriend are all flying out to Houston at the end of April for a mini-weekend vacation to visit our Dad who got relocated there. Any tips or must see/do places? amen on the margarita sister! Gorgeous poolside inspiration! I need to give this some serious thought - the unforgiving Texas summer sun will do some damage to colorful fabrics and furniture alike. So I'm trying to plan carefully. Thanks for your ongoing inspiration! So inspiring! When we bought our home 10 years ago, I was FLOORED at the price of landscaping, trees, flowers, etc. (still am) but really love the idea of a gorgeous pool and garden. Beautiful images, I love these colors, combinations and the images are perfect! Averill, forgot to mention i am now following you and would love to have you visit, I have a giveaway coming up!